The war between three armies of vampires, humans, and those in-between is in full swing. 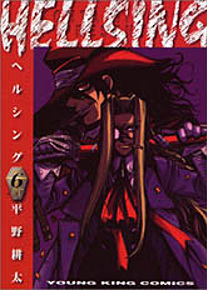 The Hellsing organization is embattled as London is falling to Nazi vampire forces, turning the city's citizens into rivers of blood and a population of ghouls. It looks like it might be the end of Sir Integral Wingates Hellsing and her henchman, Walter. But what's this? The Vatican? But that means the Vatican is unprotected. If you haven't figured it out yet, Earth is in chaos of a World War like no other. New forces will rise up, surprises of undead power will surge forth, guns will blaze, and blades will sing. There's no telling how this will end, as Hellsing clamors forward with a seething wit and a frantic pace, and style that passes beyond gothic grace. Co-published with Dark Horse.